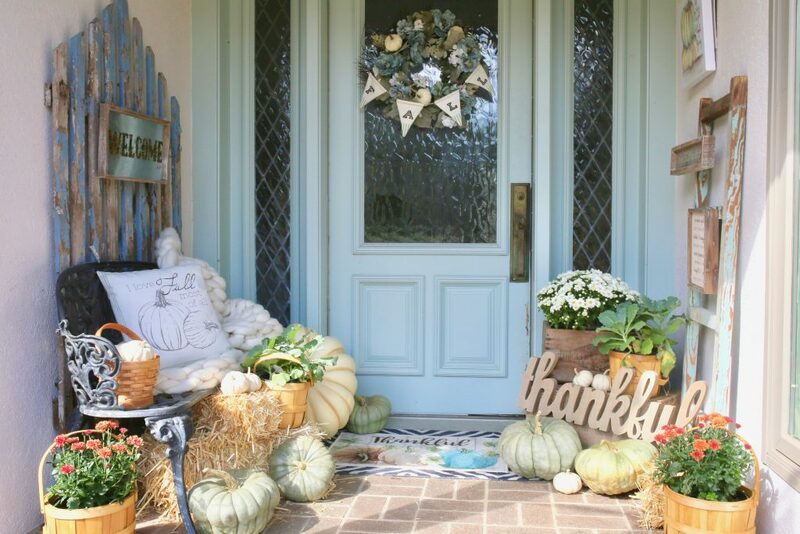 Give a welcoming Fall front porch makeover to your home to celebrate the season. 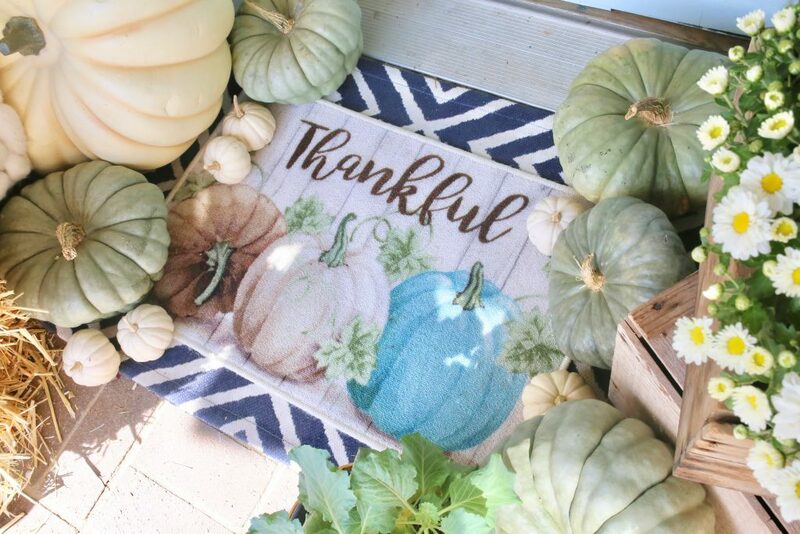 I have teamed up with some of my favorite blogger friends to bring the best of fall decor with the Bloggers Fall Extravaganza Blog Hop sponsored by King of Christmas. We are so excited to share some of our favorite fall recipes and decor tips, AND give away a beautiful 7.5 foot lit Christmas tree from King of Christmas. If you came from Megan’s pumpkin filled front porch shared on her blog at TxSizedHome.com, welcome y’all! Be sure to check out the rest of the girls linked on the blog hop, and enter to win your own Christmas tree near the end of the blog post. I love the fresh look of green in any season! Welcome to the Cuter Tudor! It’s Fall, Y’all! 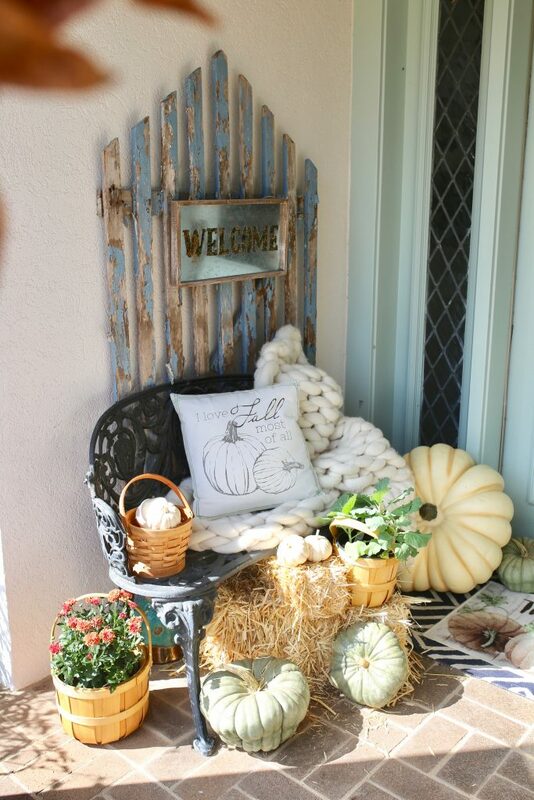 Celebrate the season of Fall by creating a cozy and inviting front porch to welcome guests into your home. 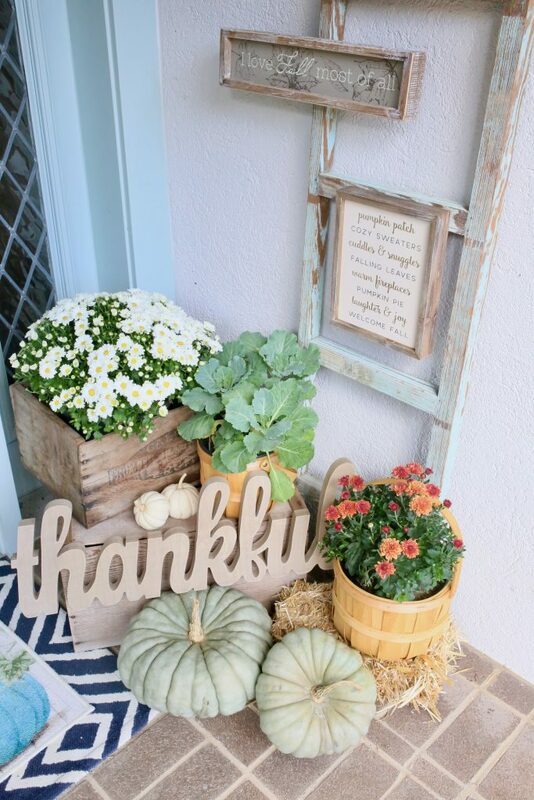 With a few fresh flowers, and lots of pumpkins, you will have your porch decorated in no time! Then, you can enjoy the rest of the season’s beautiful colors and cooler weather from your front porch. 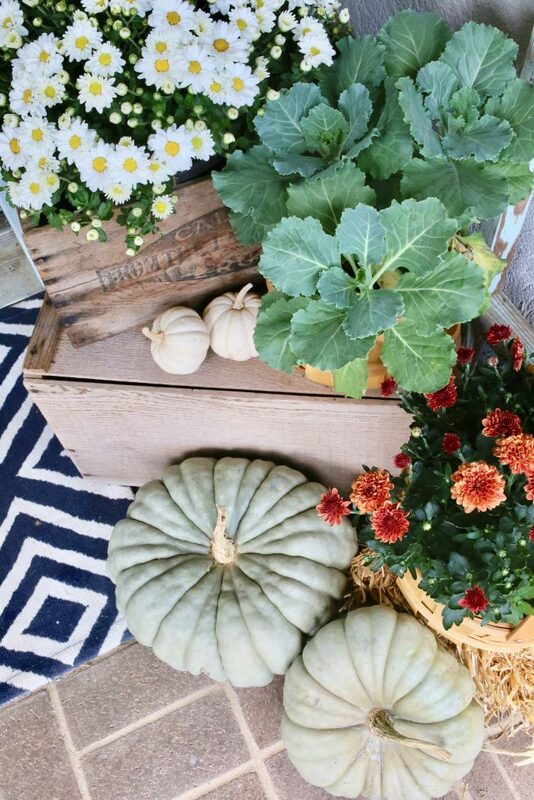 Here are a few tips to style your fall front porch. 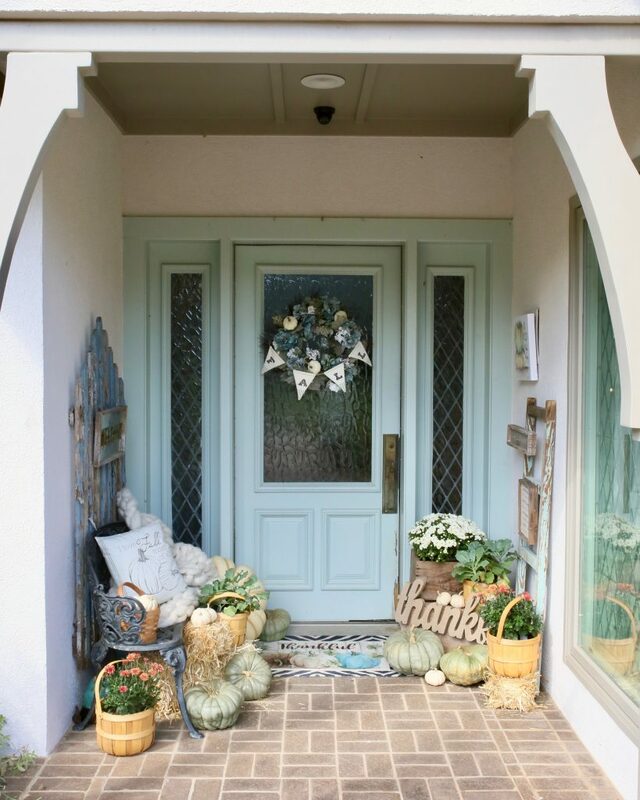 Hang a Fall wreath on your front door. 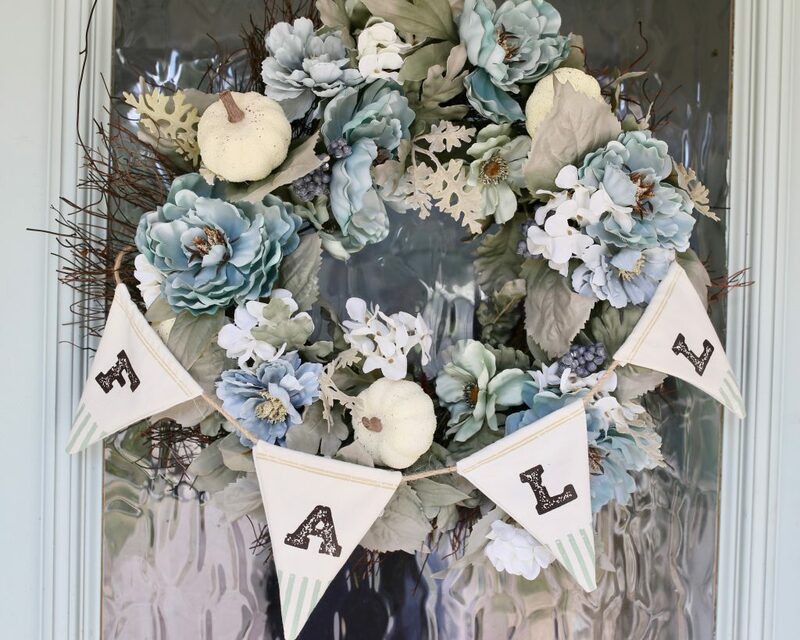 You can also add a fall inspired banner and pumpkins to a regular wreath to dress it up. I use command strip hooks to make it easy to hang! 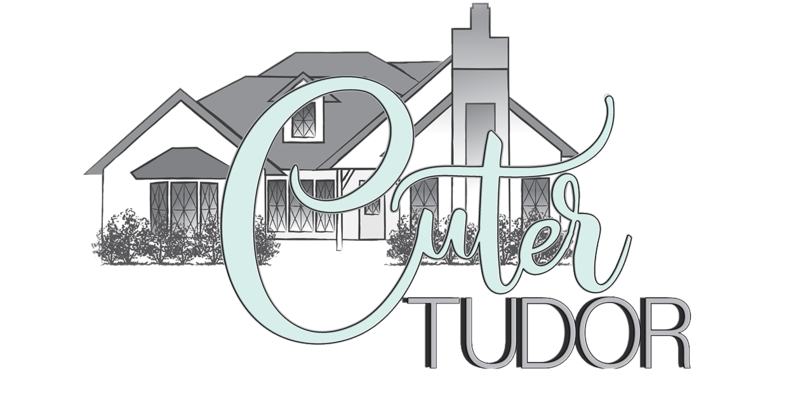 Welcome to the Cuter Tudor! Create a cozy seating area! Whether you have a big front porch or a cozy little nook, add a place to sit like a small bench or a couple of rocking chairs. Toss on a textured or plaid throw and an outdoor pillow to soften the seat. Protect your pillows by spraying with Scotchgard heavy duty water shield spray. This pillow if from Krumpet’s Home Decor. You can get 10 % off with code CUTERTUDOR. The back of the pillow is a buffalo check pattern and comes in 3 colors. I also found the fall banner and “I love Fall most of all” sign from Krumpet’s Home. Have fun shopping! Natural elements, real or faux, just give life and a fresh feel to your vignettes! 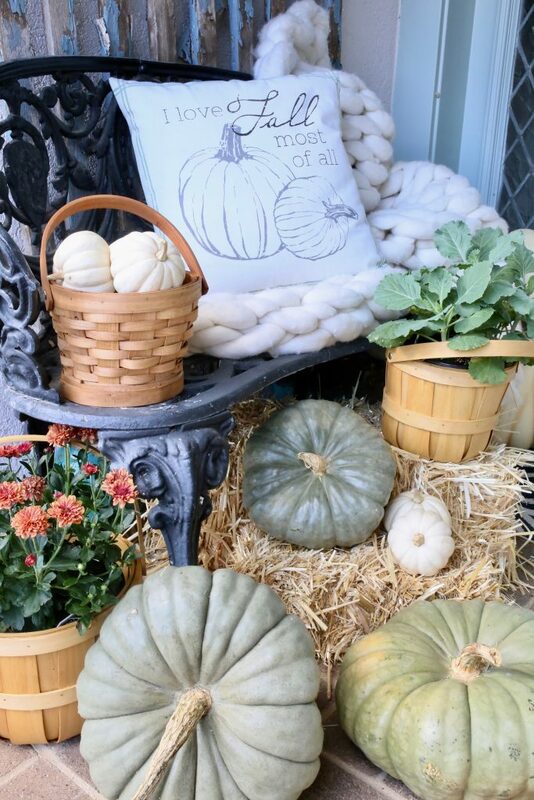 You can decorate with pumpkins from the local pumpkin patch or a few faux gourds. 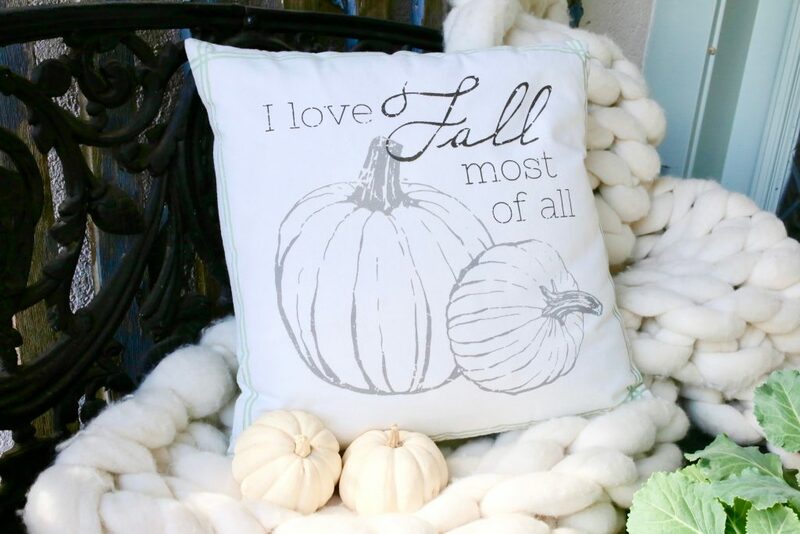 Or a little bit of both like I do on my fall front porch! Orange, white, blue or green! Get what you love, it is your home! As a home decor blogger, sometimes I see trends coming and I know certain colors will be popular. Orange is very traditional, and will always be a safe choice, a classic choice for Fall. It seemed like last year, it was out, but this year, multiple shades of orange, rust, mustard yellow are back! I got to do what I love. I LOVE blue and green Cinderella pumpkins. I love white baby boos! No matter what colors of pumpkins you love, get a variety of sizes to keep it interesting. Mums are the most popular flower for Fall and come in a variety of colors. I have seen white, yellow, orange, rust, and pink mums for Fall. Place potted flowers in wooden crates, baskets, olive buckets, enamel or galvanized buckets, or pretty planters. I also like to add greenery like cabbage or kale for a fresh look! Since the leaves aren’t changing in Texas yet, it only seems appropriate. 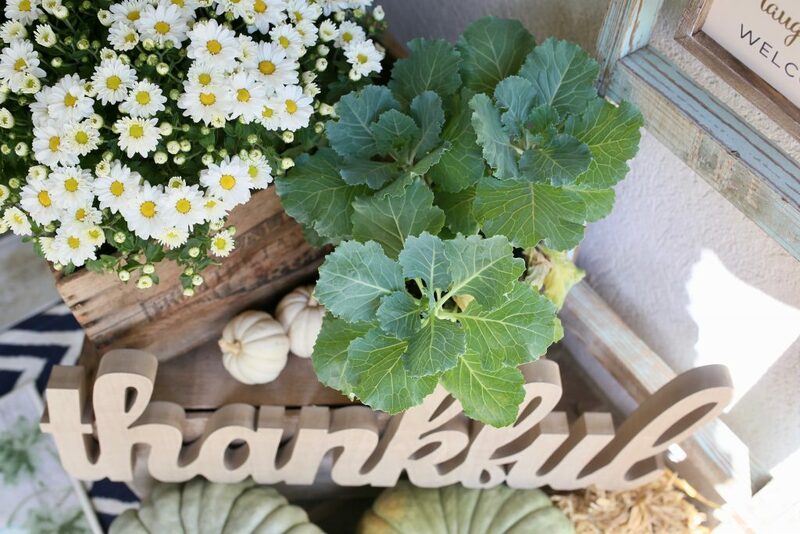 For a neutral look, get a mix of kale or cabbage for green and white mums. 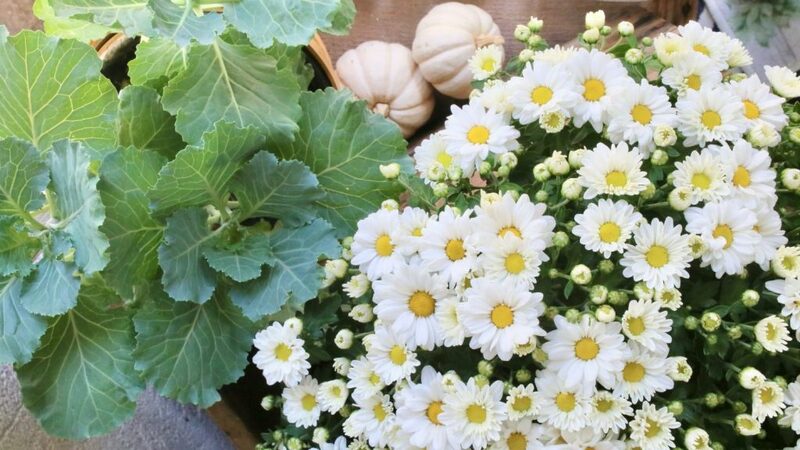 Fresh mums, greenery and pumpkins for Fall. Again, it doesn’t matter if you get real or fake hay bales. These are from Walmart and Hobby Lobby, and work in smaller spaces. 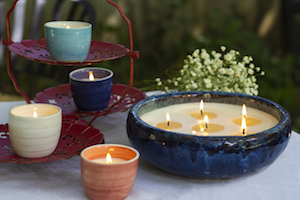 They are great to stack to add height to your vignettes, add a fun texture and a natural element. Don’t you just love fall decor? 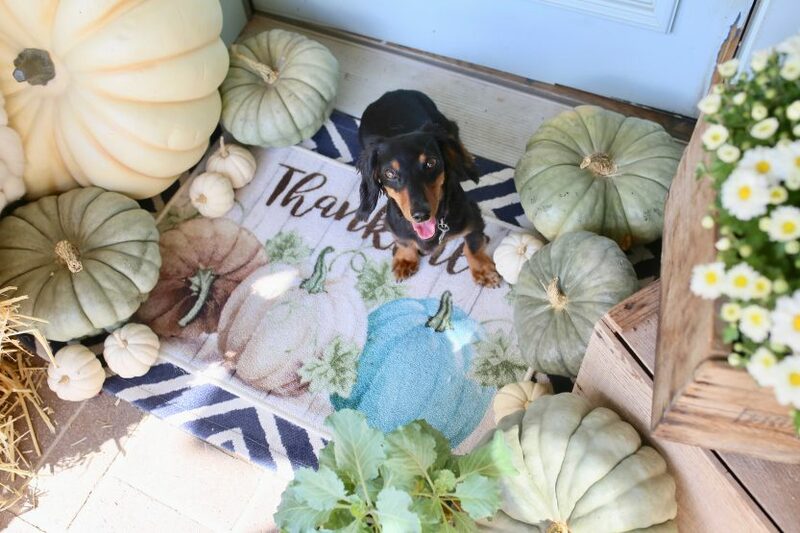 Layering door mats and rugs is one trend that I am hopping on this fall season. I love the mix of color, pattern and texture when layering different rugs together. Just make sure your bottom rug is at least 3 inches wider on all sides to create a nice frame for the top rug! I found this super cheap seasonal rug at the dollar store and layered it over a patterned rug that I use year round. Layer your door mats for a mix of color and pattern. Dogs add an extra layer of texture and cuteness, too! I wasn’t even mad when Oscar, the weenie dog, took over my fall decor photoshoot. I think he was just begging to get back into the air conditioning. 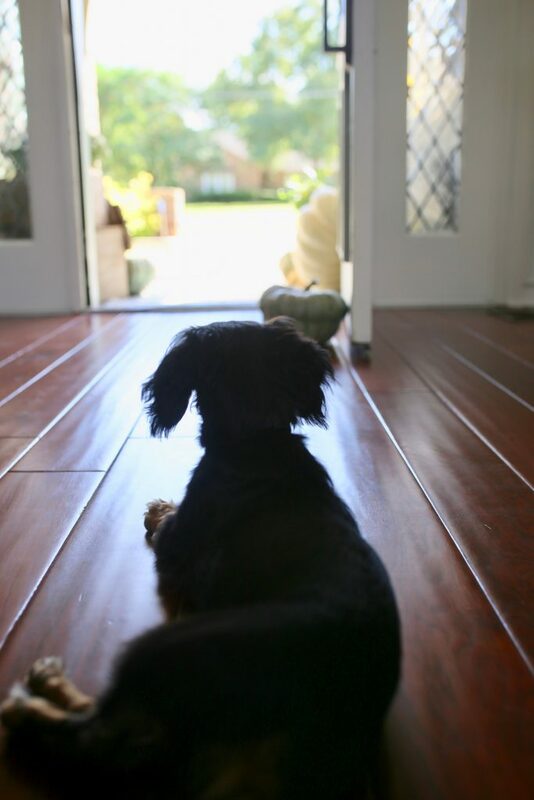 Oscar is always the first to welcome friends and family! Architectural Finds and Fall Signs! I love to mix vintage and new, so it is no surprise that I use old architectural pieces to layer some new fall decor signs. Think old gates, doors, windows, ladders, barn vents, shutters… lean them against the wall and they are ready to hang a few signs without harming the exterior of your home. The ladder and old gate also added some much needed height to the area. 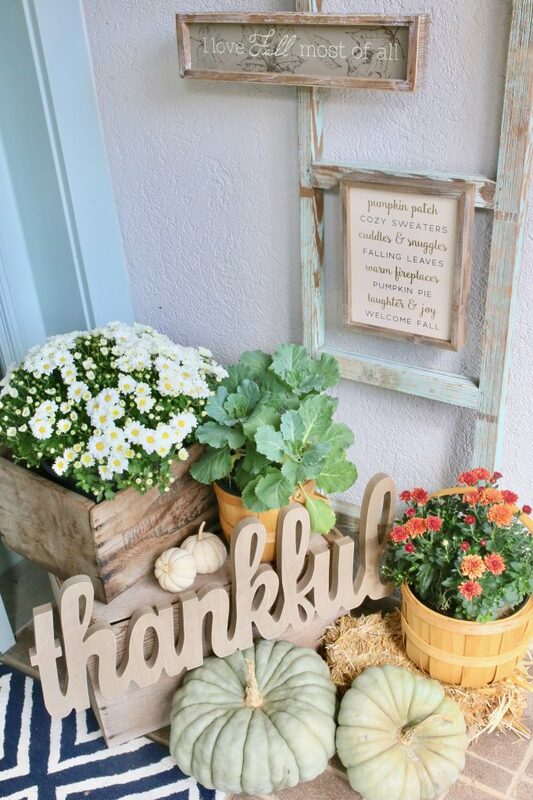 I think they add interest to my fall front porch. Wooden Ladders are great for hanging wall decor. I love to use words to remind me of the importance of the season. 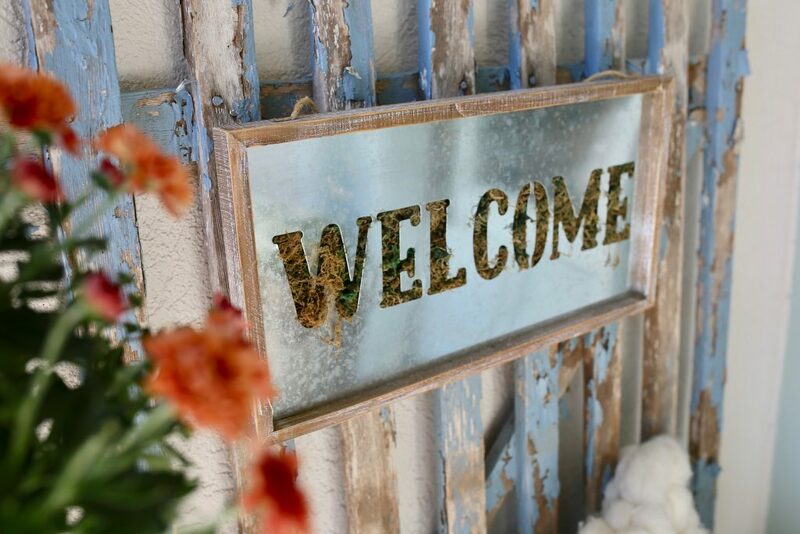 Adding a sign or two sends a direct message that guests are welcome. Use lots of layers to create a cozy feel! 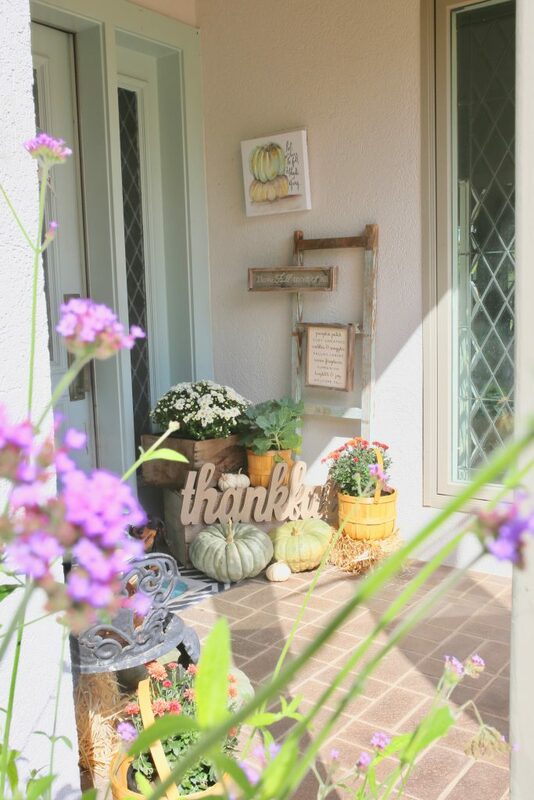 Next on the blog hop is Rochelle, at Turquoise Lifestyle Co who is sharing her gorgeous fall tablescape! But first, y’all enter to win your very own King of Christmas 7.5 foot tree! It is lit! These are the only trees that I use in my home, and I have three from 7.5 to 12 feet tall! The branches are so full, making it a breeze to fluff and decorate! These are the most beautiful trees I have seen! As of today, they are on sale! Thank you for stopping by the Cuter Tudor! Our door is always open! 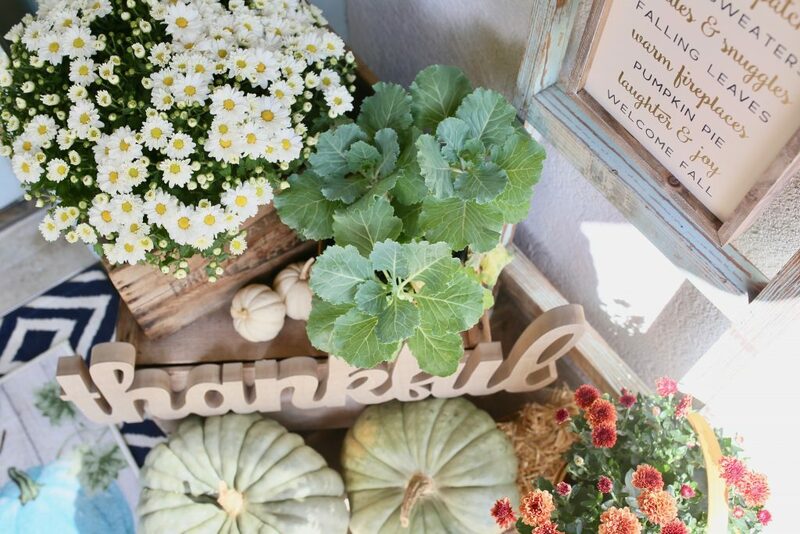 Not literally, this is Texas and it gets way too hot, but feel free to stop by the blog any time for more home decor, seasonal and holiday styling tips! I am always on instagram @cutertudor, so come say ‘hey girl,’ over there! 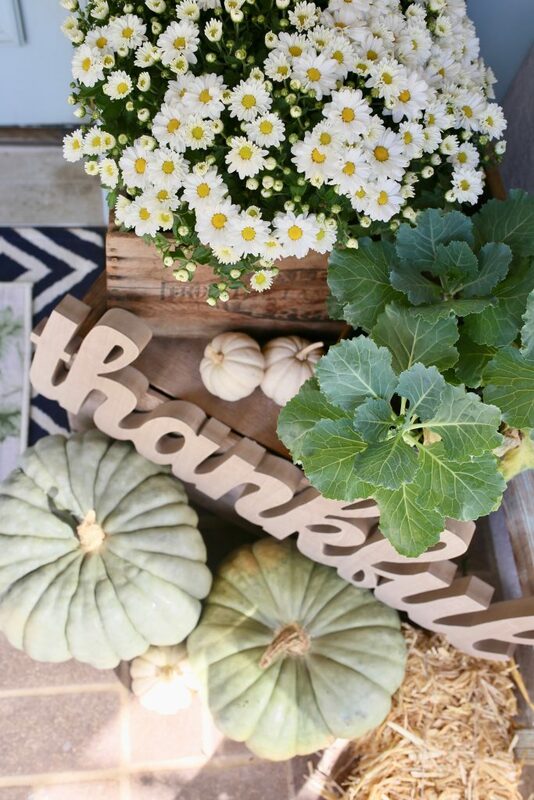 If you like something you see, add it to your fall decor Pinterest board. Oscar is waiting on cooler weather! 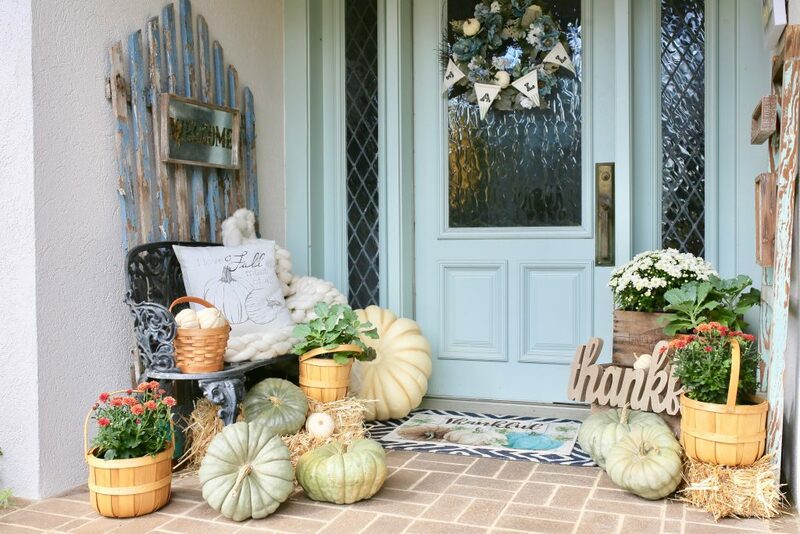 I think I just found my favorite Fall front door of the season! I love your aquas and what on score on that cute rug! 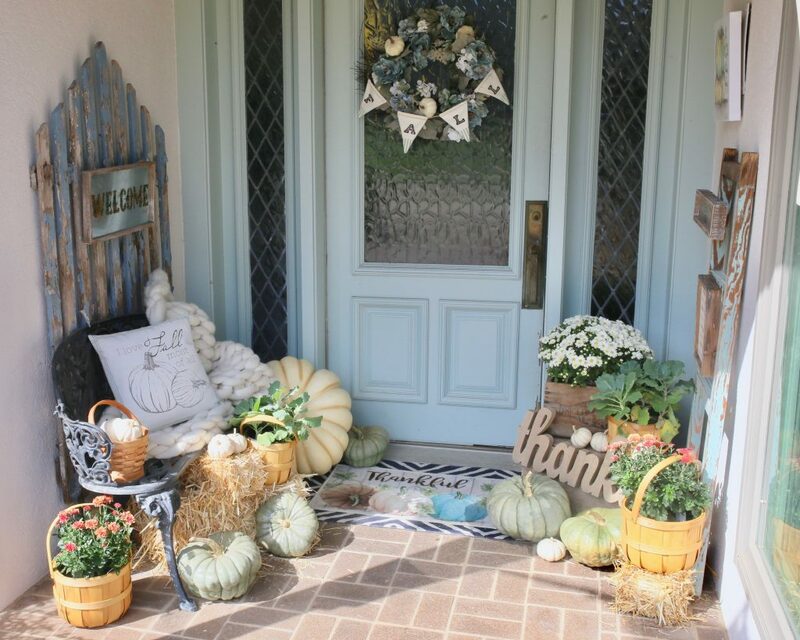 Amy, I absolutely ADORE your front porch styling! 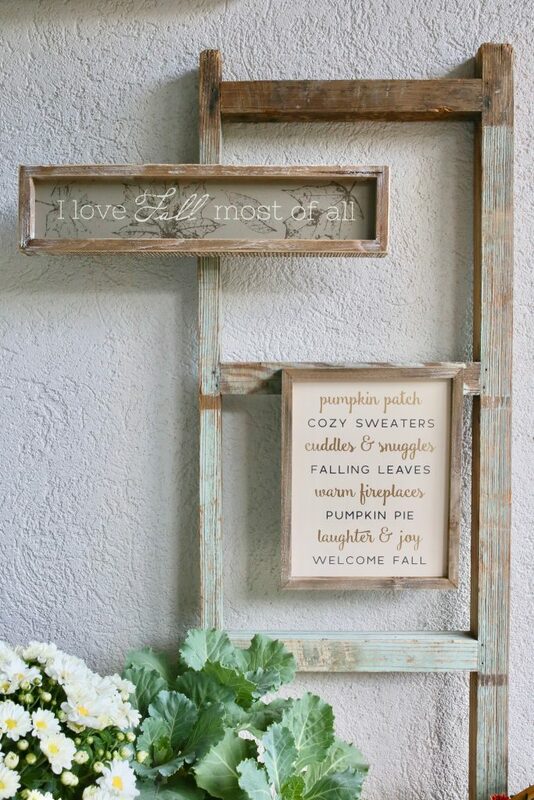 The soft colors are dreamy, and I especially love the ladder and word signs, what a great idea! That Oscar sure is a cutie!! I love everything that you did with your porch. You are so talented Amy! Amy, this is GORGEOUS! I love all the colors you used in your front porch decor. You’re a rockstar girl! !